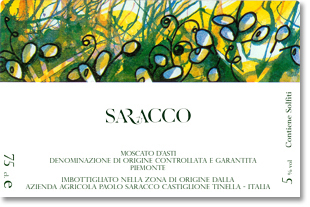 Saracco Moscato d'Asti 2008 D.O.C.G. Perfume of fresh peach, pear and aromatic white flowers. A gentle sparkle brightens the friut and a tingle of sweetness hints of candied fruits. 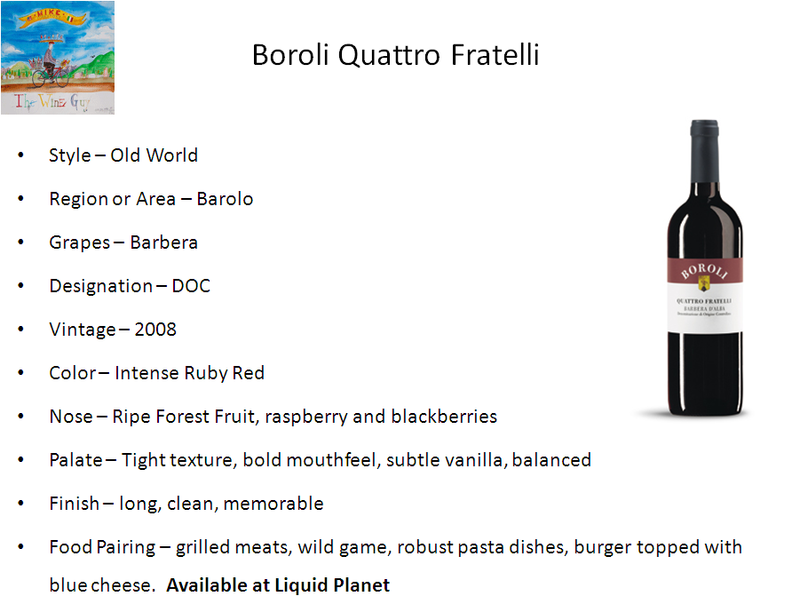 This wine is perfect as refreshing aperitif or a light finish to a meal. The Saracco Moscato d’Asti wine is made by fermenting the juice in sealed, pressurized and temperature controlled stainless steel tanks. This method of fermentation keeps the natural effervescence in the wine. 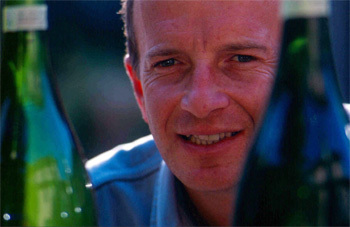 The must is held in pressurized tanks for 60 days, then filtered repeatedly to stop fermentation.The tank method allows the naturally sparkling wine to be kept fresh until it is ordered, only then is it bottled to ensure the best possible wine in the glass.Moscato d’ Asti is highly aromatic with notes of fruit and white flowers, Paolo Saracco keeps tight control of the harvest to ensure a perfect acid balance to the natural sweetness of this grape. A slight sparkle is traditional for Moscato d’Asti, it lifts the fruit and guarantees a wine that is light and refreshing. Special lands for the white Moscato, extraordinary in quality and personality, the original growing area for Asti D.O.C.G. was officially delimited as from 1932. 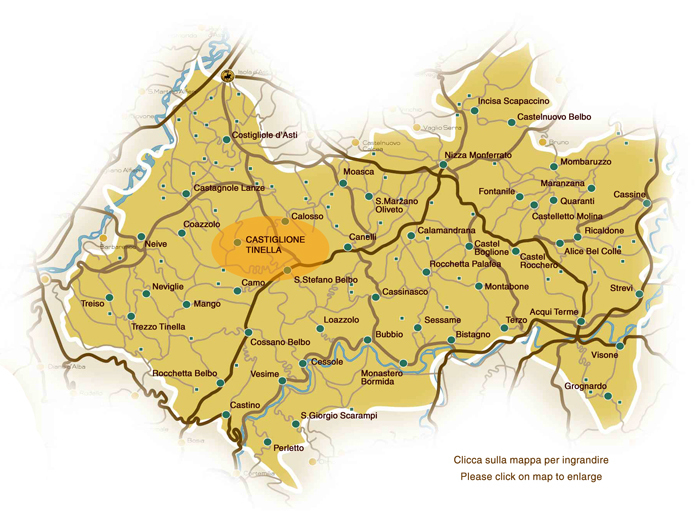 An extensive region made up of 53 Municipales in the Alessandria, Asti and Cuneo provinces has almost 10.000 hectares of vineyards dedicated to the white Moscato and is worked on by 6,800 wine growers. 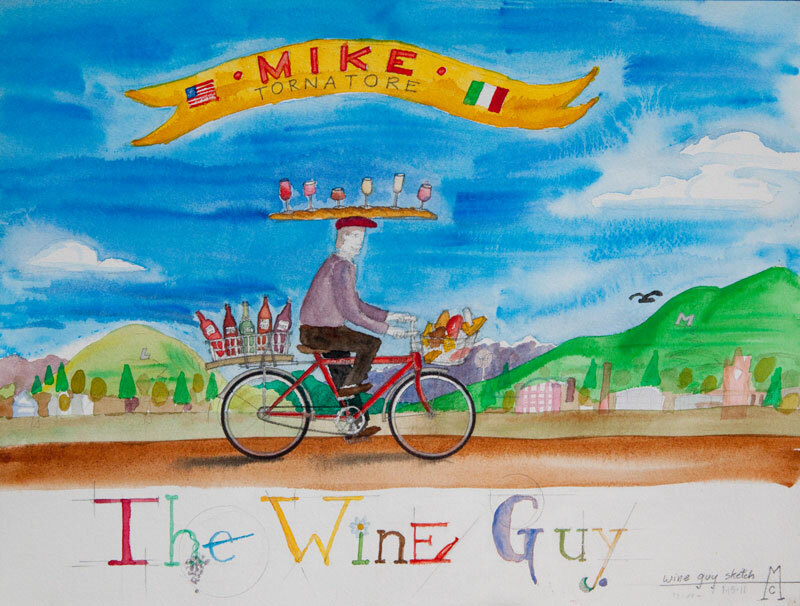 In the Langhe, Roero and Monferrato hills, the vine is king and thrives in orderly, well looked after rows, making the southern Piemonte landscape unmistakable and unique. 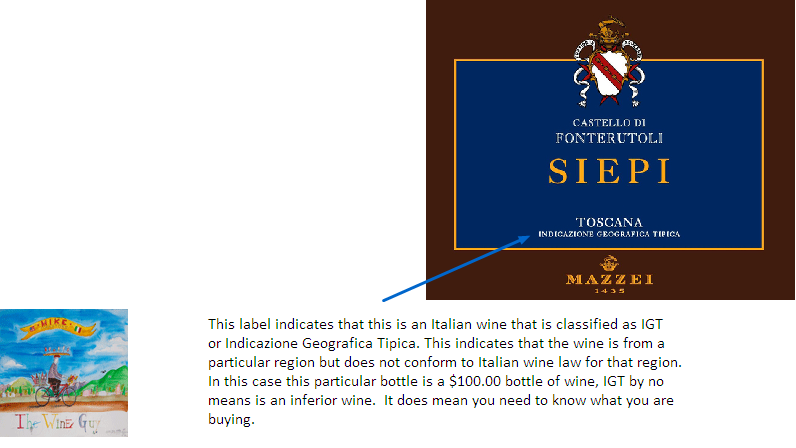 Grapes were first cultivated in the hills surrounding Castiglione Tinella in the 1600’s. Throughout history many different grape varieties were planted but Moscato d’ Asti proved to be the perfect grape for this appellation.The vineyards belonging to the Saracco family are in a perfect microclimate for the grape Moscato d’ Asti, the soil is comprised of limestone mixed with sandy veins and the elevation provides just the right temperature and humidity balance. Vineyard management and strict control over the winemaking process all contributes to Paolo Saracco being referred to in the press as the “The Maestro of Moscato”.Just one valley away is the Monferrato ridge where Saracco started planting his Pinot Nero. The soil on this hill changes distinctly from the vineyards surrounding Casiglione Tinella, where Paolo grows his Moscato d’ Asti. It turns out that the site in Monferrato produces a lovely expression of Pinot Nero with just a hint of Piemontese. Luigi Saracco, the great grandfather of Paolo began growing Moscato grapes in the early 1900’s. With each generation the legacy and commitment to quality continues.Paolo Saracco grew up in the vineyards and even at an early age he had a desire to make a wine with the family name. Upon completion of his Enological studies, Paolo began experimenting not only with new winemaking techniques, but also a more modern vineyard management style. The result has been consistent acclaim from the press, and more importantly his loyal customers. Every Saracco after Luigi has been known as “Lupetto” or son of the wolf. Paolo decided to change his labels to reflect the delicate quality of his wines, but in his heart, and in his village, he is still known as “Lupetto”. 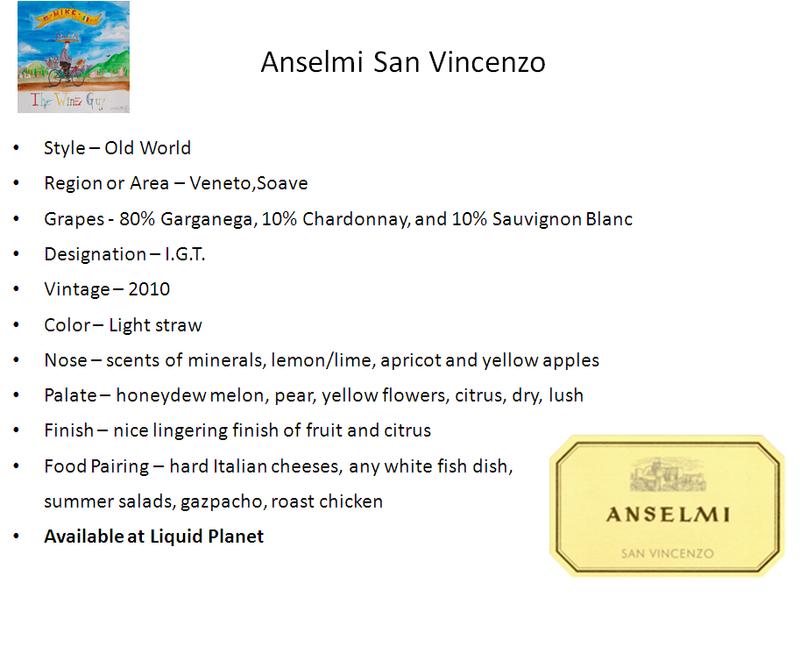 This is such an enjoyable wine to start a dinner off with friends or as a light dessert after dinner. When I think of Spring I think of something light and refreshing, this wine is it. Give it a try I know you will love it, from my table to yours.